'Tis the season for all things Merry, and this year here at Clare Florist we have a great selection of Freesias available for delivery across the UK. 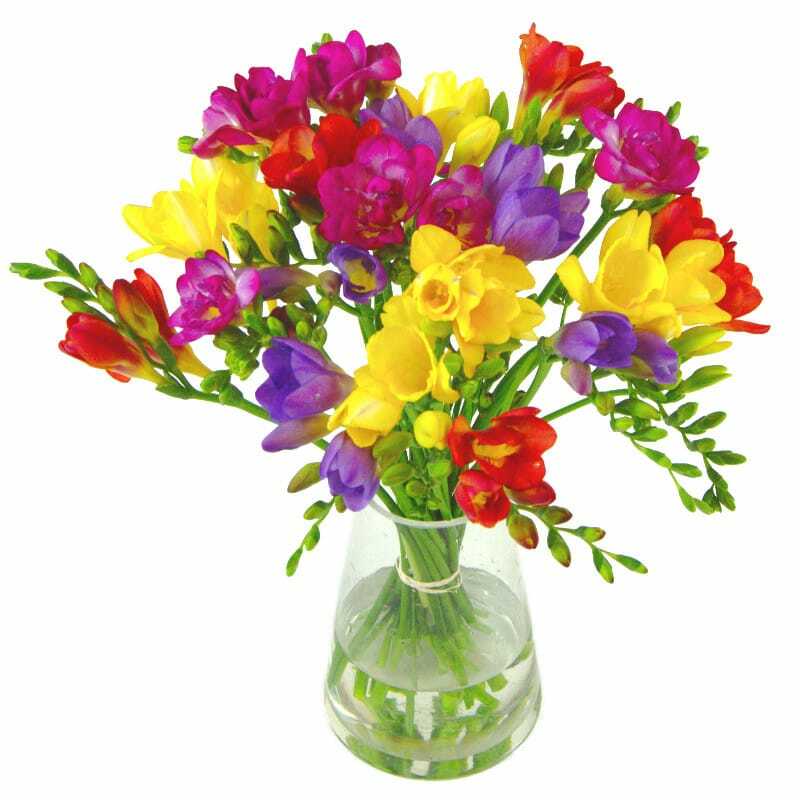 Our beautiful selection of freesia bouquets add to your home a warm, bright touch, and all of our freesias are available to order for next day delivery! For years Freesia flowers have been used as gifts, and their calming fragrance fills the room with a pleasant scent to enjoy. Whether you are looking for white freesias, yellow freesias or purple freesias, we have a great range to choose from, and our freesias are delivered to you 'in bud' to give them a longer life for displaying in your vase. Freesias originated from Africa, with many of them originating directly from the Cape Province in South Africa. The freesia flower has a unique design, with large funnel shaped flowers that give them a distinctive appeal. The freesia flower was named after Dr. Frederick Freesia after he discovered the plants, and the freesia flower is generally planted around late August to grow around December to March, and can grow up to 24 inches in height. A fantastic Freesia arrangement for this festive period is our Freesia Fragrance bouquet. This bouquet benefits from a lovely aroma and a combination of bright, colourful flowers to brighten up your home. Our Freesia Fragrance bouquet contains 40 freesia stems in a vast array of different colours, perfect for your living room upon your coffee table. Another of our favourite Freesias is our Scented Freesia bouquet, made with a dazzling array of purples, yellows and reds. 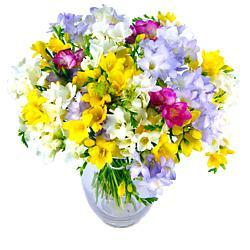 This charming freesia bouquet is perfect for sending to a loved one, and adds a colorful tone to your home. When ordering Freesias online, we can arrange for them to be delivered to you with our next day delivery service - perfect for last minute events. Our freesias are expertly packed by our team of florists, and they will arrive with you in excellent condition. Freesias are also used in soaps and oils for their light scent, and these flowers help to add a soothing feeling to your home. Oh! Freesias are indeed beautiful. And I guess a bunch of it would surely make a perfect gift for any occasion. Thanks anyway for sharing this information.